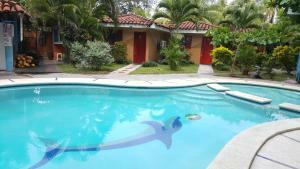 ﻿ Best Price on Tropiclub Playa El Cuco in El Cuco + Reviews! Tropiclub Playa El Cuco is 28 mi outside San Miguel on El Cuco Beach. This beachside property features an outdoor pool with a slide and a restaurant where you can enjoy local cuisine. Free WiFi access is available. Each room here will provide you with a TV. Featuring a shower, private bathroom also comes with free toiletries. You can enjoy sea view and pool view from the room. At Tropiclub Playa El Cuco you will find a private beach area. Other facilities offered at the property include a tour desk and a children's playground. The property offers free parking. El Salvador International Airport is 87 mi away. San Miguel is 40-minutes’ drive away.